Finished bars all ready to eat. It has suddenly gotten amazingly hot and sunny here in the Pacific Northwest. I LOVE IT! I am a total sun girl- everything seems better with a little sun! The only bummer is our house gets incredibly hot as the day goes on. As the mercury rises, trying to avoid further heating of the house with cooking becomes a consuming obsession. 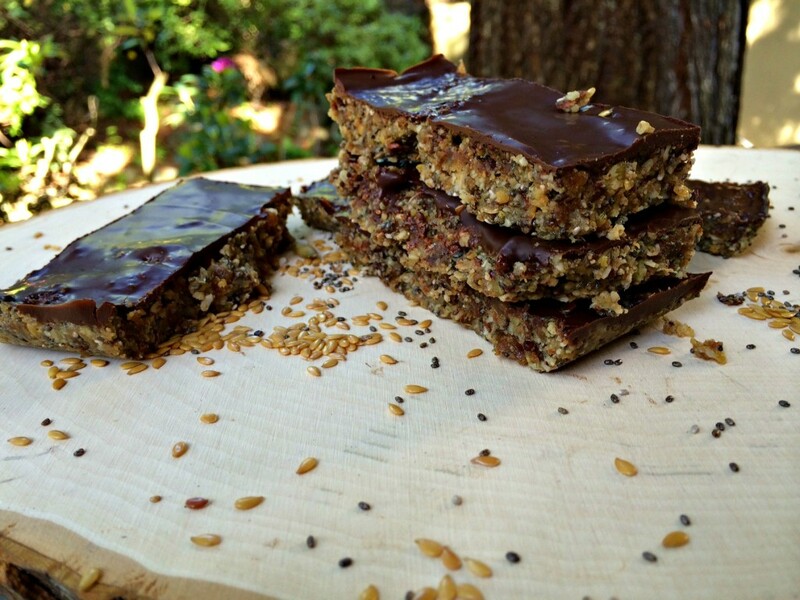 Imagine my joy when I came upon these amazing raw seed and nut bars from This Rawsome Vegan Life while surfing Pintrest (you can find me here on Pintrest). 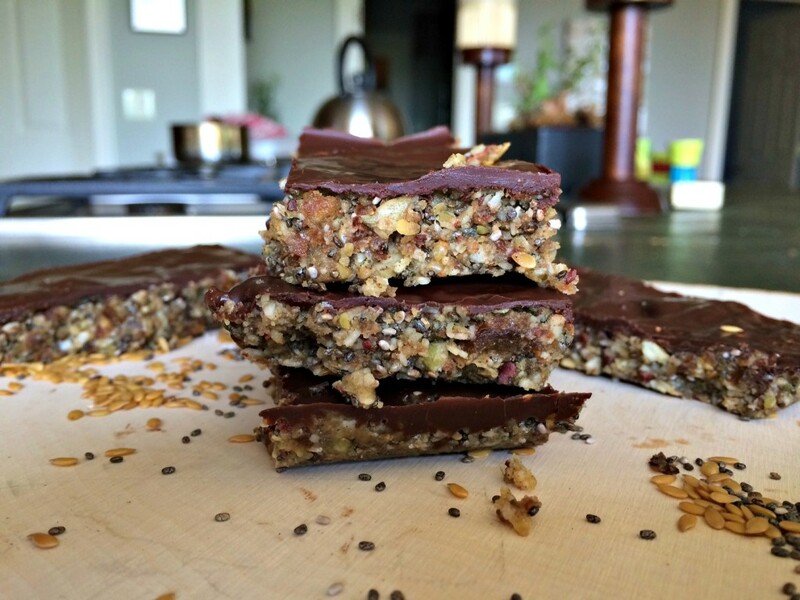 All the yummies that make up these awesome bars. These bars have everything you could possibly need for a little pick me up in a busy day. Healthy sugar from organic dates and raisins, omega-3′s from chia seeds, walnuts and flax seeds and protein from all those seeds and nuts. Pumpkin seeds further contribute to the omega-3′s but they also give a much need boost of zinc (read here about the benefits of zinc. ).The medium-chain triglycerides (MCTs) in the coconut oil provide a blast of increase energy expenditure compared to the same amount of calories from longer chain fats. And, of course, I couldn’t resist adding a dark chocolate covered topping to increase my antioxidant exposure. 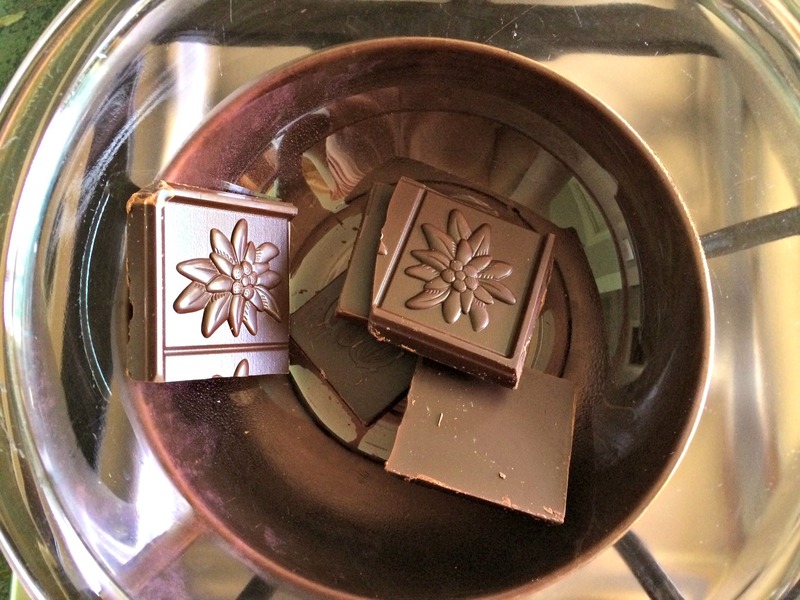 (Read more about the benefits of dark chocolate here. Dark chocolate squares melting in double broiler. I put the dark chocolate squares on the stove in a makeshift double broiler while I started the grinding of the seeds and nuts in the food processor. After the nuts and seeds resembled a course crumb, I gradually added the raisins and dates. Mixing this all together required some time, with multiple stops to scrape down the sides of the food processor. I used roughly 2 tbs of coconut oil but you will have to judge the stickiness of your own dough. The moisture content of the dates and raisins seems to impact how sticky the dough becomes. 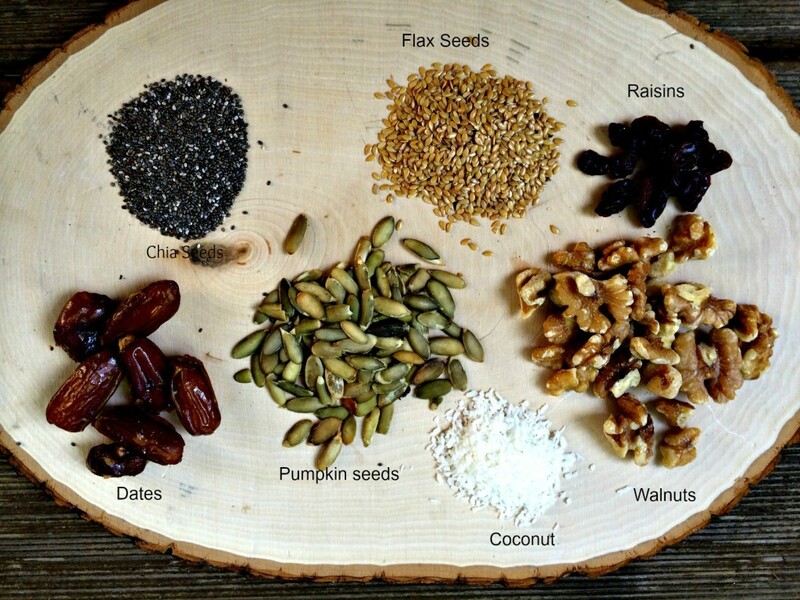 All the ingredients before being ground. Melting chocolate for the topping. Bars with melted chocolate ready to go to the fridge to harden. These were super easy to whip up and so tasty! I think they might be my new favorite bar! 4 Dark chocolate squares for topping. Melt dark chocolate over double broiler on the stove. 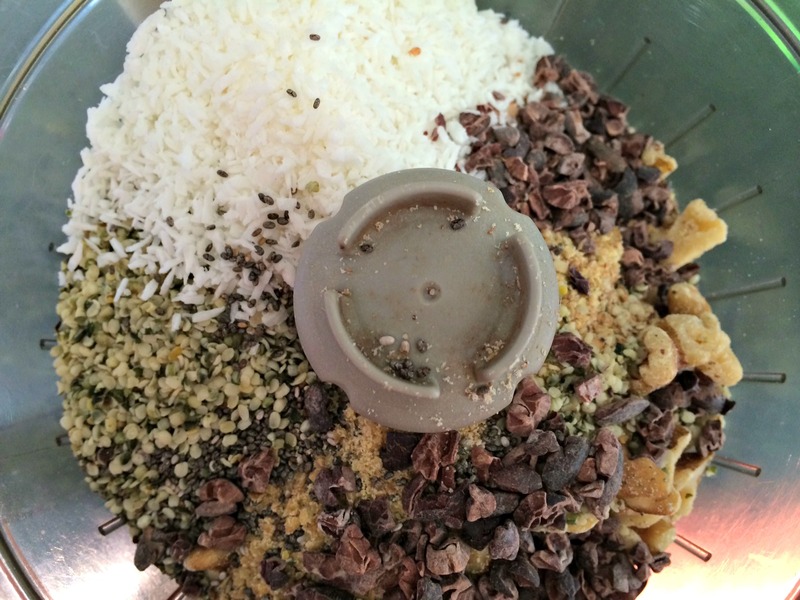 Put all ingredients except raisins, coconut oil and dates in food processor. Process until you have a course crumb mixture. Process until dough starts sticking together. Add coconut oil as needed to help with sticking. Put dough in parchment lined pan. Use your hands to press to uniform depth throughout the pan. 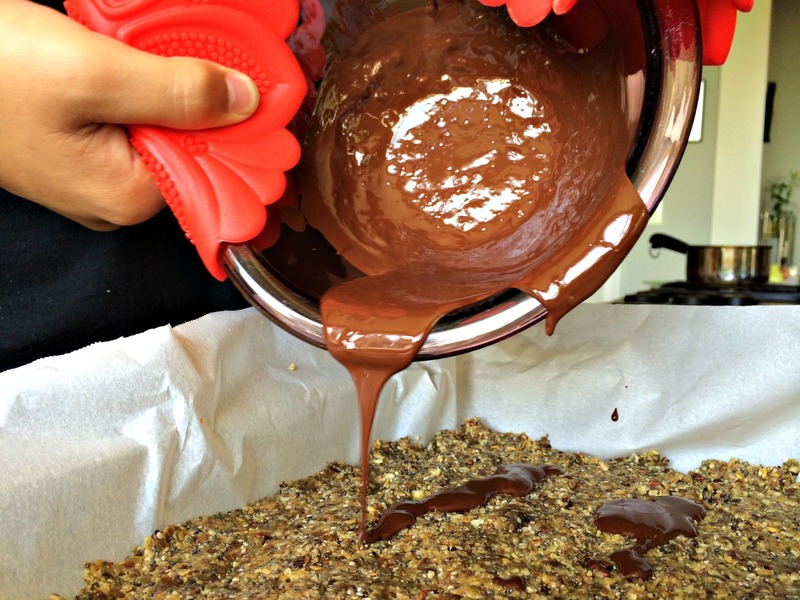 Pour melted chocolate over top of bars. Put bars in fridge for about an hour. Once firm and chocolate hardens, take out and cut. 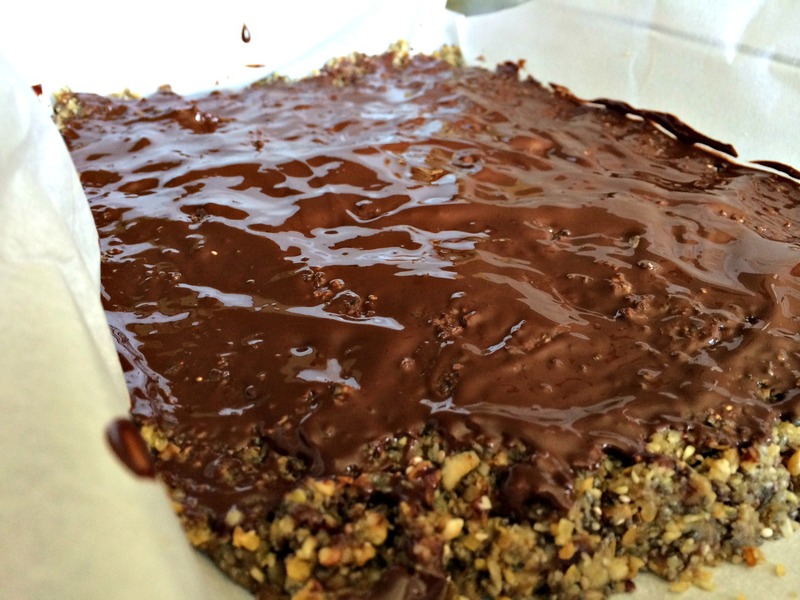 Share a link to your favorite bar recipe! This post was shared with Gluten Free Homemaker, A glimpse Inside, Homespun Oasis, The Nourishing Gourmet, Rock My Vegan Socks, Food Renegade, Today’s Creative Blog and Live Laugh Rowe..
← Tiny Tip Tuesday: Drink Your Red Wine??? Seems like I’ve been seeing nut bars everywhere lately! Maybe this means I need to make some asap, and your recipe sounds delicious. They look like they might taste like the halva my husband and I used to be obsessed with making. Very similar ingredients, but with a touch of cinnamon! These bars look incredible! I’d have to swap out a few ingredients due to other intolerances, but I’m sure the results would still be amazing! Thanks for sharing this recipe on Gluten-Free Wednesdays.